P2: "The Princess of Helium would bring precious ransom but Tal Hajus prefers thy death instead as a warning for thy race to trespass not upon our land!" P3: Suddenly a shrill scream echoes piercingly in the locked courtroom -- something hurtles down from above. P4: "Woola!" cries, John Carter. "Woola! Kill Tal Hajus! Kill! Kill!" The Calot buries fangs in the skull of the shrieking Jeddak. P5: Tied to the calot's neck are a key and a note: "Thank Tars Tarkas for the key to your shackles -- outside there are thoats to ride... Sola"
P6: Hearing the death cry of Tal Hajus, his guards batter down the courtroom door. P7: As the guards race toward them, Dejah Thoris cries in dismay: "The locks are old and rusty, John Carter, and I have not strength to turn the key!" 1. The intervention of Woola, into the scene where Tal Hajus threatens Dejah Thioris, is a creation of JCB and disagrees entirely with ERB's telling of the story and with the version given in The Funnies. A way must be found to reconcile the events portrayed in strip #6 with the orthodox ERB narrative. Woola's actions here parallel those detailed in the episode where he saved Carter from the white ape -- perhaps some innovative tie-in between these two Woola episodes can be manufactured, so as to explain the events of strip #6. 2. The scene where Dejah Thoris obtains the key from Tars Tarkas (with which she unlocks Carter's chains) is another invention of JCB. It must be reconciled with the ERB story, without diminishing the effectiveness of the escape plot elements set out in strips #6 and #7. The "death cry of Tal Hajus" should be eliminated from the novelization. CHAPTER 6: "KEY OF DEATH"
Some Barsoomian scientists speculate that the green race is a product of devolution, that in time will degrade to the equivalent of calots, then to plant men and finally become worms. It is an interesting theory but it certainly does not take into account transformations such as the one wrought in the heart and mind of the green girl Sola, during the time she spent with John Carter and Dejah Thoris. A few of the green race have a capacity for loyalty; fewer still learn the rudiments of friendship. But until the telling of the story of Sola, daughter of Tars Tarkas, no Barsoomian would have imagined that green Martians possess the ability to love. And even those who know something about her might never guess that she possessed the virtue of modesty. She herself once asked that her role in Captain Carter's adventures not be recounted in any great detail. But the reader cannot hear the story of Dejah Thoris of Helium without also hearing something more of the story of Sola of Thark. During those short two minutes the green female Sola was also busily employed outside the palace walls. Since all Thark warriors recognize the metal of Tars Tarkas, none of the giants paid attention to the girl who wore his insignia when she brought three brawny thoat steeds to the courtyard outside of Tal Hajus' living quarters at the royal palace. All the actions of the green leader and his daughter were performed with the greatest speed and with all possible secrecy, so John Carter's only clue to the intrigue underway was Tars Tarkas' seeming stupidity in failing to appropriate his weapons -- that, and also something the green giant whispered in the chained man's ear before he left: "Farewell, John Carter; you are the only man on Barsoom I've ever liked!" John Carter cursed the fact that he had not learned enough of the Barsoomian language to understand all of the special phraseology employed by Martian royals when they converse together. Chained to the wall, only yards away from the throne room, he could hear snatches of the conversation going on between the jeddak and the princess. He could also catch the occasional thoughts of Tal Hajus but had difficulty making any sense of them. Then the conversation ceased, the meanings came together in his mind and he understood. At that same moment a shrill scream echoed from the throne room -- the scream of the Princess of Helium! "Woola!" cried John Carter. "Woola! Kill the green man, Go! Kill! Kill!" In an instant the huge calot sprang to its many feet and bounded through the open throne room doorway. A mixture of vivid telepathic images pierced Carter's brain. In his mind's eye he could see Dejah Thoris recoiling from the giant's six-limbed embrace. He also received an impression of Woola, tusks ready for the kill, dashing the bellowing jeddak to the floor. The Earthman's mighty alien muscles strained at his shackles. The foot clasps snapped open but the steel wristbands withstood his effort. Then one of those also snapped, leaving him flatfooted on the floor and attached to the wall by a single chain. His short sword and other things were piled on the floor only inches away. 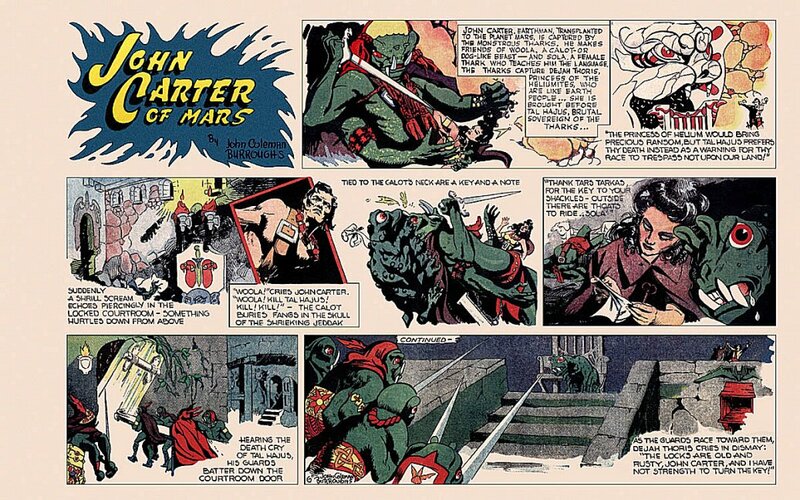 John Carter stretched out one foot with all his strength. He hooked a toe under his sword belt and kicked the long-sword into his waiting free hand. Listening to female screams emanating from the chambers of their jeddak was a daily routine for the palace guards, so they paid no attention to Dejah Thoris' shriek of pain. But shortly thereafter they all heard the echoing cry of Tal Hajus and that reverberation sent them scurrying off in a pack to the throne room. For some unexplained reason the door's lock was jammed and the guards wasted precious time hauling over a large table to use as a battering ram. Then, in entering through the broken door they were puzzled to see John Carter at the other end of the hall, sword in hand, but with one wrist chained to the wall. The foremost guard hesitated, wary of a possible trick. However, they were twenty against one. The green swordsmen proceeded to rush forward with horrible curses on their lips. The commotion in the adjoining hallway caught the calot's attention and he wheeled about to look for trouble. His master's voice and thoughts were calling out for him. Dejah Thoris followed the leaping calot out through the one open door she could see, slowing only for a second to pull a dagger from the fallen Jeddak's gold-encrusted harness. He appeared to be dead but she did not tarry to make certain. In the spacious hallway beyond the open door, her senses were bombarded with a wild intermixture of sights and sounds. The Jasoomian was hanging from the wall, hacking at a padlock and chains with his long-sword and shouting to Woola. The unrestrained roaring calot was leaping onto the extended swords of nearly two dozen palace guards at the far end of the hall. And those same green giants were yelling, cursing and knocking one another over, as all of them tried at once to squeeze through an entrance space built by a race half their height! Many of the women of Mars are trained for battle in their younger years, but the royal daughters of Helium are taught how to command the armed fighters of the empire, not how to fend off a dozen attacking swordsmen at a time. Still, the first thing Dejah Thoris did was to pull Captain Carter's short sword from its scabbard and ready herself for the inevitable onrush. Upon seeing that the Earthman was still struggling to free one manacled wrist, a sudden idea came to her. "John Carter! This dagger will help!" The girl took a step backwards and handed him the knife she had taken from the fallen Tal Hajus. Here was a deadly key indeed; its razor-sharp blade and keen point were fashioned from the highest grade of unbreakable Ptarthian steel. "My radium pistol!" cried John Carter. "Can you use it?" The Earthman's gunbelt was still hanging on the wall nearby, where Tars Tarkas had left it when the three of them went in for the audience with Tal Hajus. The pistol, however, was now missing and its holster was empty. In the gun's place was a brief note, written in blood on the retaining strap. Dejah Thoris tried to make sense of the crude inscription "Outside the double window, thoats to ride." The only green Barsoomian she knew of who could read and write, even a little, in the hieroglyphics of Helium was Sola of Thark. Dejah Thoris had spent the past few days instructing the curious girl in that particular skill. "John Carter! There is no pistol here -- yet I have found hope. Sola has left you a message. If we can reach the double window in the throne room -- Oh please! You must open the lock!